The Artist's Daughter, this Norman Rockwell painting, appeared on the cover of The Literary Digest published September 23, 1922. The alternate title for this painting is Little Girl with Palette at Easel. This illustration was Rockwell's fortieth picture featured on the cover of The Literary Digest. Starting with his first cover painting in 1918, Boy Showing Off Badges to the last, The Night Before Christmas in 1923, Norman Rockwell artwork was published on The Literary Digest cover forty-seven times in all. 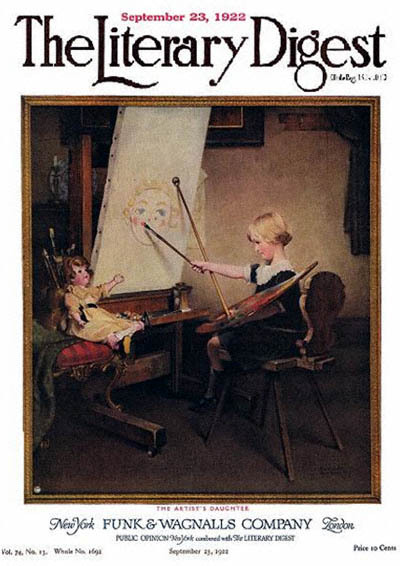 Rockwell artwork was featured on the cover of The Digest nine times just in 1922. The original oil on canvas painting, 42 x 37.5 inches or 106.5 x 95 cm, is part of a private collection. The illustration was reproduced on page 60 of Norman Rockwell, A Definitive Catalogue by Laurie Norton Moffatt. Rockwell loved painting children in amusing situations. Here we see an artist's daughter painting a portrait of her doll. Her doll apparently makes a very good model, never breaking a pose and never needing a break. And the doll's modeling fee is right in her budget. She holds the paintbrush the way she has seen her parent, the artist, hold it. She also holds it the same way old photos show Rockwell held his paintbrush. She uses a prop from the palette to the canvas to keep the canvas within easy reach. The chair she is sitting in is too high to allow her feet to touch the floor. The Artist's Daughter was only one of 47 Norman Rockwell Literary Digest covers; here is the list of more Norman Rockwell Literary Digest scans. We can safely assume that she is using the artist parent's painting tools and paint. Whether she has been encouraged to develop her talent is the real question this painting evokes. The Literary Digest editors named this painting. At the time, Norman Rockwell had no children. He never had a daughter, so the painting's title is even more ironic. We can safely assume that this must have been some other artist's daughter. I just received this email from the model's daughter and am sharing it here. I am writing to you about the print The Artists Daughter. My Mother, Evelyn Kurleff, was the model for this Literary Digest cover. She lived on Bank Street, around the corner from Mr Rockwell's studio, on Prospect St. in New Rochelle, NY. She often told me how he saw her playing on the street and asked a neighbor who she was. Then came to her door and asked if she would pose for him.